The Bunkhouse offers a pleasant and clean environment with modern facilities. There are two bedrooms and each bedroom has two bunkbeds with private en-suite shower and toilet. The bunkhouse also benefits from an underfloor heating system and reliable showers; a perfect welcome back for you after a long day out on the hill. The accommodation is perfectly geared up for hillwalkers and mountaineering clubs or people touring the NW Highlands. There is a shared kitchen/dining and lounge area. The kitchen has all the usual appliances and all cookware and cutlery is provided. Bedding is also provided and towels may be hired upon request. For those with damp/wet gear we have a large effective drying room. The bunkhouse rooms are based on a mixed dormitory basis but rooms can be hired on an exclusive use basis. 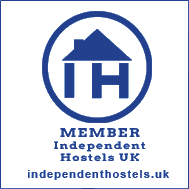 We are a member of the Independent Hostel Association and you can search for other hostels/bunkhouses around the UK by clicking on the undernoted logo. *please note that 1st night rate is always payable as a deposit regardless of number of nights staying. To secure a booking please use this form. Payment in advance of the first night stay is required as a non-refundable deposit and this can be done by BACs or cheque. For overseas customers with no UK bank account payment can be made by using our online payment system. Occasionally we would like to send newsletters and offers and the latest info from Forest Way by Email, post, SMS and other electronic means. We take your privacy very seriously and will only use your personal information to administer your account and to provide the services you have requested from us. If you consent to us contacting you for this purpose please tick to say how you would like us to contact you.